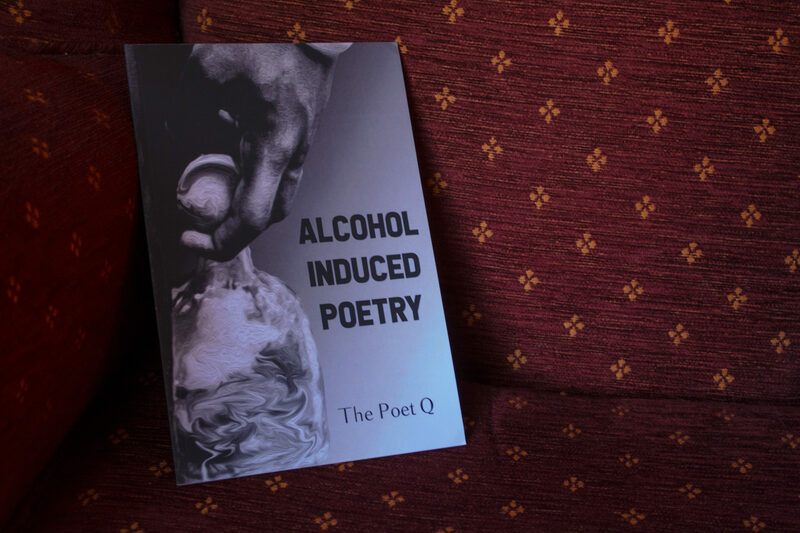 I got to interview The Poet Q about his poetry and new chapbook, Alcohol Induced Poetry. Mary Ann Mahoney: Hi Q! Can you tell our readers a little about yourself? The Poet Q: I’m 27, an introvert, been told I have a great smile, love to watch anime, and don’t sleep anywhere near as much as I should. I really like to travel but I’m not much of an adventurer anymore. Lost my spark a few years ago and I haven’t quite gotten it back yet. Hoping to find the passion and excitement again. I’m from South Florida but I move around a lot. Never liked staying in one place for too long. MAM: How old were you when you started writing poetry? Why did you start? Q: I was about 15. I had to do a book report for my English class and I was really into Ernest Hemmingway books at the time. We had the option to do a formal report or poem. I didn’t like to write essays then and still don’t now, so I wrote a poem about For Whom the Bell Tolls. It was surprisingly good enough for my teacher to give me a pretty good grade. I’ve been writing poetry ever since. MAM: Is this your first chapbook? Q: It is my first of many, hopefully. MAM: What inspired you to write this chapbook? Would you describe it as somewhat autobiographical? Q: At first, it was just a bunch of poems in a notebook. I’d only write when I was drunk. A few years ago, I started my first blog and it was received well but I still wanted to do something more than that. After struggling with alcohol abuse, I thought about publishing what I wrote. I felt like it was a different perspective. I had words that needed to be shared to let others that have been there know that they aren’t the only ones. Maybe it might help. Yeah, I’d say it’s somewhat autobiographical. A lot of the poems are very personal. MAM: These poems seem almost like a confession. Would you say that’s accurate? Q: They are. I don’t share much about myself with anybody. Family and friends had no clue about most of things that are in the chapbook. MAM: It seems like you’re addressing your poems to someone in particular. Can you tell us who that is? Q: I’m addressing whoever is willing to read it. There are some people that I hope read it and they will know it’s about them or a moment that they have witnessed. MAM: When did you realise that you wanted to write your emotions down on paper? Q: I was about 16 or 17 and really having hard time at home. I didn’t talk to my parents about anything of importance at all. So, I wrote about what I was feeling. Usually tore it up and threw it in the trash afterward. It was my therapy. I stopped after I left home and didn’t pick it back up until my Cousin passed. I couldn’t make it to the funeral. I needed a better outlet than drinking myself to sleep every chance I got. I decided to write about it in conjunction with drinking and it seemed to help. MAM: Is there a reason you chose to write a collection of poetry instead of prose? Q: I never gave it much thought. Poetry always felt a bit more natural. I’ve tried prose but always seemed to lose interest fairly quick. MAM: Did you write this for yourself or with an audience in mind? Q: Initially, it was for myself. Somewhere along the way, after it had all been written, I felt the need to share. Thought that somebody else may need to see it. MAM: Tell me about your poem writing process. Do you have any writing rituals? Q: Music is always involved, and I have to be in some type of mood. If I don’t have the mood then I’ll just write a bunch of nonsense. It’s almost always in one go. I have a hard time recreating the passion after walking away and coming back. MAM: Is there any particular reason the first poem has the same title of the chapbook? Q: I wanted to set the tone in the beginning. Make it very clear the state and mindset that these poems were written in. I thought that poem was the best for it. MAM: How has the reception of your book been so far? Q: It’s been ok. I was really nervous about it at first. Curious how my family would feel about it, but so far so good. MAM: Is there a reason why you write under the name ‘The Poet Q’ and not your real name? Q: Almost everybody I know calls me Q. I was playing around with names and I thought The Poet Q was nice and simple. MAM: Do you believe in writers block? Q: I believe in it a bunch. I get it all the time. Massive brain farts, forgetfulness, loss of focus mid-sentence. I’m at my best when I’m in the moment. Once that’s gone, it’s over for me. MAM: Is there a reason you chose self-publishing over traditional publishing? Q: I really wanted to do traditional publishing initially, but I was having a terrible time finding anyone that had any interest in my work. MAM: Are you working on any other projects? Q: Yes, I’m currently working on two more. I’m working on a larger collection of poems that get a little deeper into emotional situations. I’m dedicating myself to more romantic poems. The second project is definitely a tragic love story. I’ve been working on that one for some time. I’ve been procrastinating on completing it. MAM: Are there any other poets that you admire or is there a specific poem written by someone else that really stands out to you? Q: To be honest, I admire everybody that writes poetry. I may not relate or be able to understand everything associated with a writer’s poem. I really fall in love with the fact that they can express a feeling or scene in a way that makes you want to experience it or witness it. MAM: Do you have anything you’d like to say to other poets/ writers? Q: Keep creating and inspiring others to do the same. Words are powerful and you never know how many lives you could be saving. MAM: Where can our readers find you online? Q: I can be found on Twitter and writing to my heart’s content on my blog. MAM: Where can people buy your chapbook? Q: Amazon. It’s available for Kindle as well for the on the go readers. MAM: Thanks for speaking with me today!